Plymstock Camera Club is a friendly well established club with a thriving membership. The club always welcomes newcomers whether experienced photographers or complete beginners. We offer a broad range of improvement, how-to and practical evenings, internal and inter-club competitions, critique evenings, lectures and instruction by experienced photographers as well as inspirational speakers. As a club we seek to faciltate what the membership wants as well as educate and broaden everyones skills. You would be welcome to come along as our guest to see if we are the club for you. (Located 1/3 of the way between the Dean Cross traffic lights at Plymstock Broadway and the waterfront at Oreston). Copyright for the images on this site are held and retained by the individual photographers. On the evening all members and visitors £2.50 inclusive of draw ticket, tea & biscuit with an additional charge for visitors for selected speakers. New members are particularly welcome at the start of our season and throughout the year. You will be able to attend the club on two occasions as a trial with a paid membership required on the third evening. This websites Gallery has been updated so please check it out via the tab above. Tuesday 2nd April will see Brian Galbraith visit Plymstock Camera Club give his judgement and appraisal on both the DPI (digitally projected image) of the Year 2018-19 Trophy and the Print of the Year 2018-19 Trophy. This is a great opportunity for those considering joining us next season or just to visit as you will get to see many of the best dpi images and prints as entered during this season. Entry only £2.50 and that includes a cuppa and a raffle ticket as well as the opportunity to hear Mr Galbraiths opinions on the images. This evening is always popular and we hope to see you all here. Last summer BBC Radio Devon ran a competition to find 20 great images that celebrate where we live. They wanted to celebrate our county and the talented photographers who capture so many amazing images of life here in Devon. The winning images are to be blown up and used to cover the BBC broadcast vehicles which are seen by thousands of people across the region. Matt's image of Plymouth Hoe (displayed below) was one of the winning images. All 20 images can be viewed at the National Park Visitor Centre, Princetown until the 17th April. They are open 7 days a week, 10-5pm. Members and any guests will be invited to view, discuss and appraise the 2019 Western Counties Photographic Federation DPIC Competition Digital Images. Plymstock came a very respectible 26th place jointly with Newton Abbot and Shaftesbury out of a total of 57 clubs in the region. Judge Pedro Landers visited and gave his very informed and constructive appraisal of what proved to be a very high standard of photography in both trophy competitions and the delighted winners were handed their certificates and applauded by all those present. Plymstock Camera Club again this year supported the "Fun Palace" taking place at Plymstock Library with an exhibition of club members prints. Thanks to all those that enabled this event and those that went along to support it. 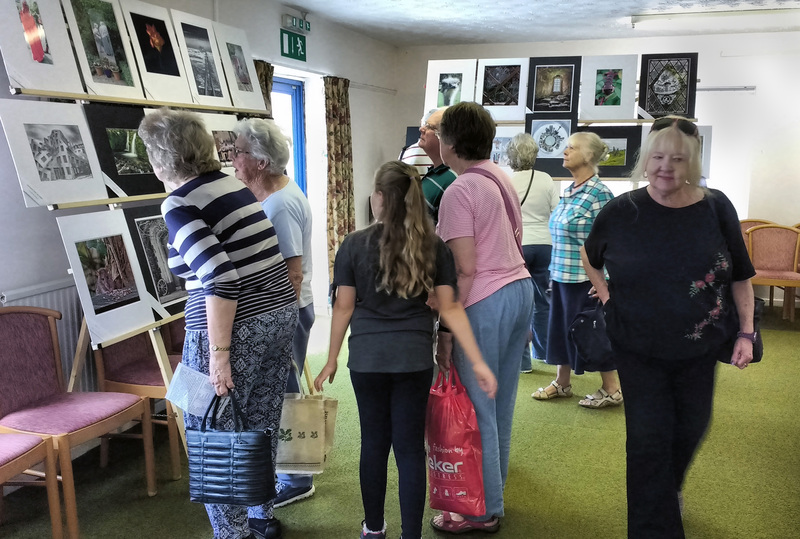 Saturday September 1st saw Plymstock Camera Club committee and members setting up a fantastic print and rolling digital display of images at the annual Plymstock Fair which had not taken place last year. Many visitors to the fair took time to view and discuss the images with members that were present. The display looked great. One ex-member who visited stated the standard had indeed gone up! The above image shows a few of the visitors clearly very interested in what was on display. Watch out in the local South Hams Gazette as one of their contributing photographers took a press photo of a few of the memebers attending.